Last Wednesday afternoon we travelled over to Manchester. We called into the City Art Gallery to take a look at the Martin Parr exhibition currently showing there, then had a look around the Christmas Market. 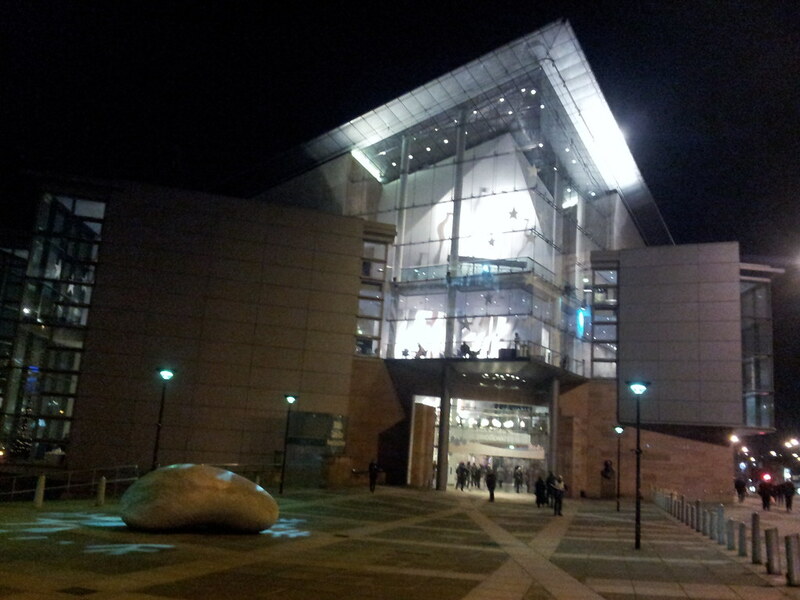 But our main reason for the visit was to see Kate Rusby’s Christmas concert at the Bridgewater Hall. Kate Rusby is an award winning folk singer from Penistone in South Yorkshire, very well known on the folk circuit, who’s had a number of albums that have sold well and made the album charts. Her Christmas concert is based around old traditional versions of carols as sung around the pubs in South Yorkshire . Some of the songs were well known carols but sung to a different tune – for example While Shepherd’s watched sung to “On Ilkley Moor B’aht ‘at”. She performed 3 versions in all of this well known carol, all set to different tunes. Other songs included the familiar carols, “O little town of Bethlehem” and “Joy to the World”. She played with her band – a guitarists (her husband), a bouzouki player, an accordionist, a double bassist (who also played a Moog synthesiser) and a drummer, plus a five piece brass ensemble. The brass band gave it a real northern Christmassy feel. For someone who isn’t so tall (!) she has a big stage presence and twinkling eyes and a smile almost as wide of the stage and chatted away between the songs. She really did seem to be enjoying herself, a true performer. As with other of her Christmas shows we’ve seen, the concert was in 2 halves, finishing, after the encore, at 10. So they were on stage in total for over 2 hours, but it didn’t seem that long. So another enjoyable night out. And Christmas starts here! 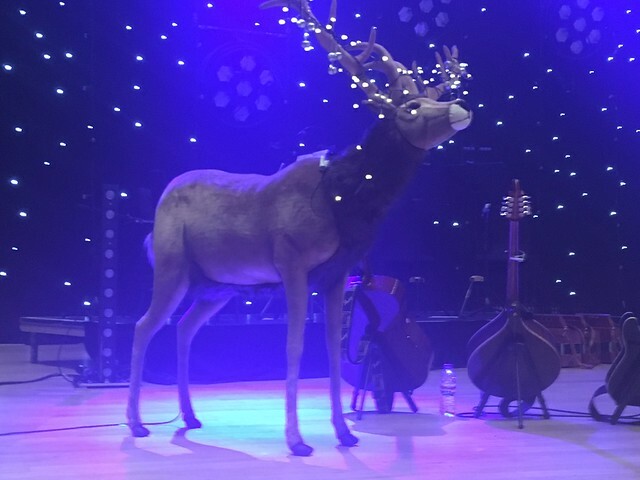 It seems to have become a Christmas tradition for us – going to watch Kate Rusby. It’s the third time we’ve been the South Yorkshire folk singer’s Christmas show. The first time in Warrington 3 years ago. We missed out last year due to my jolly to Australia but this year made sure we got tickets for the show at the Bridgewater hall in Manchester last Monday. She played with her band – two guitarists (one her husband), an accordionist and a double bassist, plus a five piece brass ensemble. The brass band gave it a real northern Christmassy feel. As previous years, the concert was in 2 halves, finishing, after the encore, at 10. So they were on stage in total for over 2 hours, but it didn’t seem that long. So another enjoyable night out. And Christmas starts here! 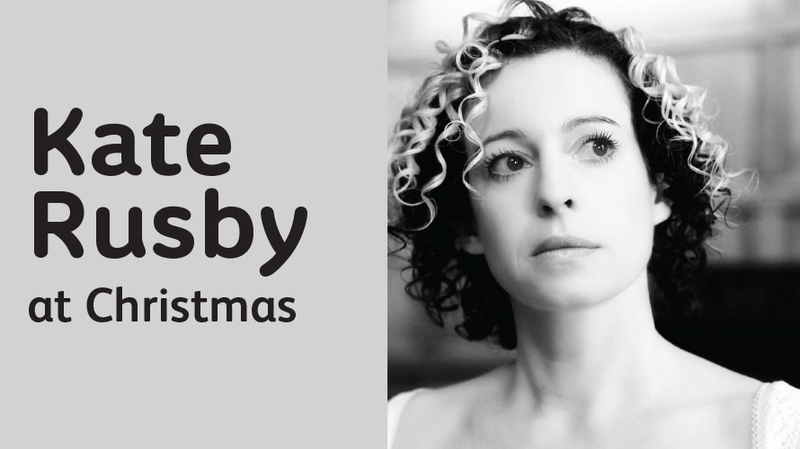 Last year we went to see Kate Rusby perform in Warrington the week before Christmas during her annual Christmas tour. We really enjoyed the concert so this year got in early to book tickets for her performance at the Bridgewater Hall in Manchester that took place last Tuesday, managing to get tickets towards the front of the the stalls. I finished work a little early and we managed to get on a train to Manchester just before ten to five, do we arrived at Victoria about 5:30, which gave us a good 2 hours before the concert was due to start. 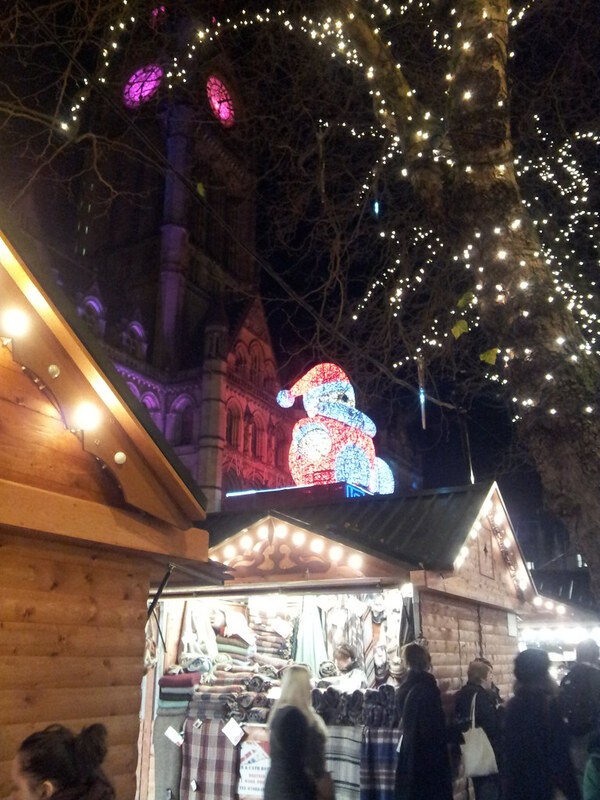 We ues this as an opportunity to saunter through the Christmas market. It’s massive, extending all the way from the Corn Exchange through to Albert Square with stalls packed into all the pedestrianised areas. We weren’t buying – even if we’d wanted to we didn’t want to be carting anything into the concert – but we had a good browse. However, we did end up buying some cheese off one of the stalls having been tempted by a sample. 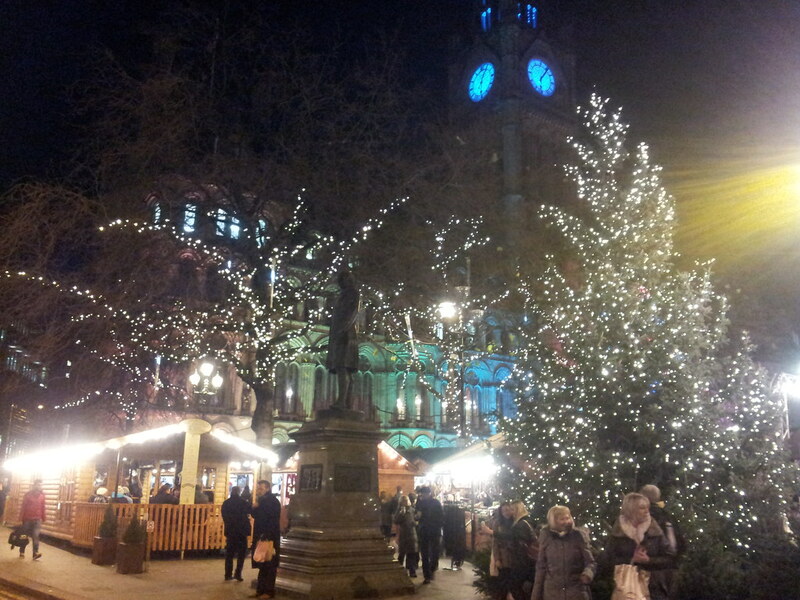 We made our way to Albert Square which was very busy even at 6 o’clock. 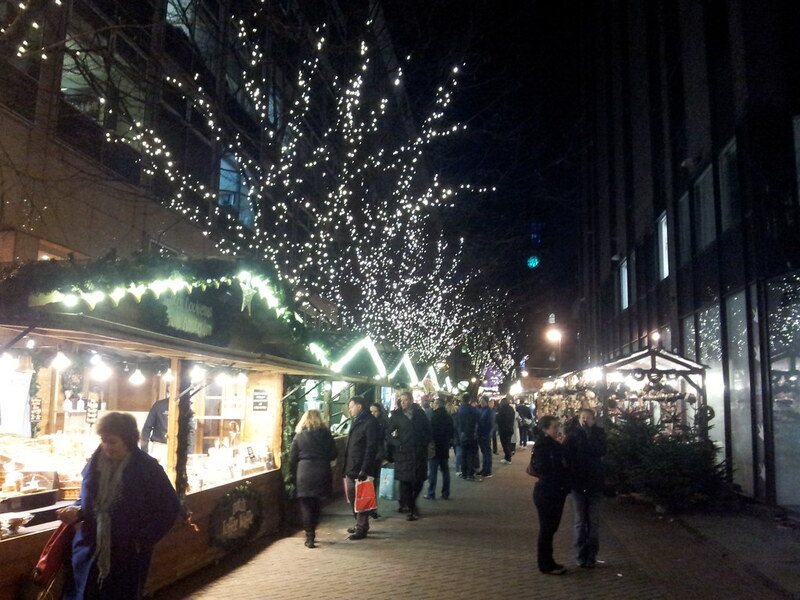 It was the original location for the Christmas Market which has expanded outwards over the years. There were lots of stalls selling food and drink of various types and nationalities so there was plenty to choose from and choose we did. And then it was time for the concert. We enjoyed it enormously again. Kate Rusby is an excellent singer – a beautiful voice – and she’s such a cheerful character, with a big smile permanently on her face. She has a band – double bass, guitar, bouzouki (a traditional Yorkshire instrument?) and accordion – who were supplemented by a small brass ensemble of 5 musicians. Her Christmas concert is based around old traditional versions of carols as sung around the pubs in South Yorkshire (a tradition that’s probably died out by now). Some of the songs were well known carols but sung to a different tune – for example While Shepherd’s watched sung to “On Ilkley Moor B’aht ‘at” (one song to the tune of another – if you ever listen to “I’m sorry I haven’t a clue” on Radio 4 you’ll know what I’m referring to). The brass band really make it feel Christmassy. The concert was in 2 halves, finishing, after the encore, at 10. So they were on stage in total for over 2 hours, but it didn’t seem that long. So another enjoyable night out. And Christmas starts here! I had a very enjoyable night out yesterday at the Kate Rusby concert at the Parr Hall in Warrington. She’s an award winning folk singer from Penistone in South Yorkshire, very well known on the folk circuit, who’s had a number of albums that have sold well and made the album charts. She’s got a beautiful “sweet” voice. Amazingly, she’s been performing for twenty years and to celebrate this released an album “20” with twenty of her favourite songs from previous albums, re-recorded and featuring guest artists. The Warrington show was part of Kate’s annual Christmas tour where the shows consist of carols, based on a South Yorkshire working class tradition of singing carols in pubs. Some were the familiar carols we’ve grown up with, but in some cases with an alternative melody, other carols particular to the South Yorkshire region and other Christmas songs. Apparently there are over 30 different versions of “While shepherds watched their flocks by night”. 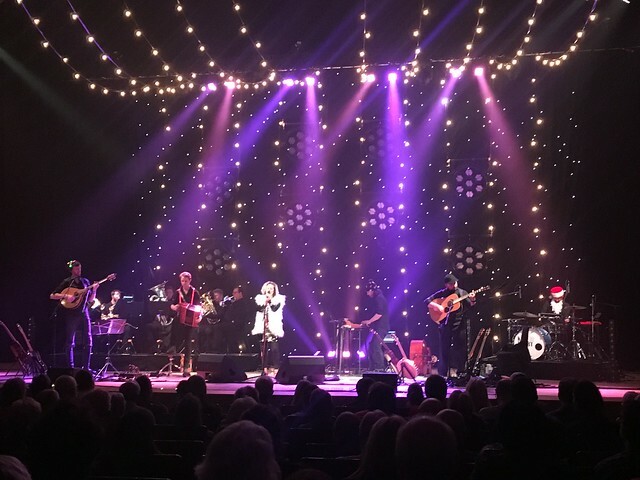 She performed two of them last night – starting off with “Cranbrook” a version sung to the tune of “On Ilkla Moor b’aht ‘at” – it was like “one song to the tune of another” (fans of Radio 4’s “I’m sorry, I haven’t a clue” will know what I’m talking about!) . Apparently the tune was written for this carol by someone from Kent, and it was only later adopted for the Yorkshire national anthem. Other songs in the two hour set (broken into two halves by an interval) included the familiar carols, “O little town of Bethlehem”, “Joy to the World” and “the Holly and the Ivy” (with an alternative melody), traditional South Yorkshire wassailing songs “Here We Come A Wassailing”, “Poor Old Horse” and “The Wren” and other carols and songs with a Christmas theme. There was also an instrumental medley performed by her band, which referenced several well known Christmas tunes. The second half culminated in “Sweet Bells”, another version of “While Shepherds Watched …”. Now I’m a confirmed atheist (although not a militant one), but I’m a real sucker for carols. Last night she performed for a full two hours, split into two halves with an interval. She played with her band – two guitarists (one her husband), an accordionist and a double bassist, plus a five piece brass ensemble. The brass band made it a real “northern” English affair, even if the bassist was Scottish, one of the guitarists was Irish and the other from Bath. And one of the guitarists played a bouzouki for some of the time. Despite this being a Greek instrument the instrument is often played by folk groups. I guess it’s like a big mandolin really. One of the first things that struck me when Kate and her band came on stage was how tiny she was! Perhaps it’s because the band members were tall? Possibly, but despite her small stature she had a big stage presence and twinkling eyes and a smile almost as wide of the stage. She really did seem to be enjoying herself, a true performer. In between songs she chatted away. Some reviewers don’t seem to like this, but I thought that it made the experience more intimate. This was helped by the venue too, which was not so large that you felt remote from the performer. We were in the 8th row so were quite close to the stage, but I think that even people on the back row of the stalls or circles would still be able to see what was going on and wouldn’t be able to appreciate the intimate atmosphere. It was a real Christmassy show and now I’m starting to get into the mood! As I’m writing this I’m playing a CD of her Christmas songs and carols.